Join us and make someone’s day with these Community Service Projects. As neighborhood groups want to open their project to other members, we will post them on this site. Each project is listed below. Thank you to all of our members who give of themselves with these projects and many others. Each year the ASG Indianapolis Chapter sews approximately 5,000 stockings that are sent to our troops and military families with Indiana ties serving overseas. As long as our troops are fighting for our freedom, we want to give a little taste of “Back Home in Indiana”. The stockings are given to the Hero Outreach group who fill the stockings with candy and goodies and then pay postage to mail the packages overseas. This past year we were joined by the Family Career and Community Leaders of America (FCCLA) in our effort to create these stockings. The FCCLA members are from many central Indiana high schools. This is a good project for high school students. Giving of their time and talents have been much appreciated. The Christmas Stocking instructions and pattern can be found here: Christmas Stocking When your stockings are completed, contact communityservice@indyasg.org to make arrangements for pickup. St. Vincent Seton Hospital provides comprehensive acute care for those who are potentially critically ill and requiring more specialized treatment and intensive nursing intervention than generally available within more traditional nursing home and sub-acute care programs. Services include: ventilator and individualized weaning programs, complex infusion therapy, long-term wound care, chemotherapy, respiratory, physical, occupational, and speech therapies, surgery, radiology, dialysis, laboratory services, telemetry and hemodynamic monitoring to name a few. As each person leaves the facility, they are given a quilt representing continued warmth and concern of their caregivers. This is a gift that reminds the patient and their family of the care and love of those behind the quilt (St. V’s staff and Indy ASG). It is hoped that the quilt will provide comfort and peace as they approach the next phase of their journey. 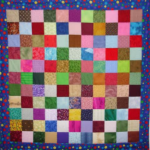 Approximately 100—125 quilts are needed each year. When your quilt is completed, contact Brenda Lambert at 745-434-3247 or communityservice@indyasg.org to make arrangements for pickup. The March of Dimes NICU Family Support Program has asked the Indianapolis Chapter of American Sewing Guild to help provide comfort to babies that are in the neonatal intensive care unit (NICU). The Women’s Hospital houses the largest NICU in Indiana and has nearly 1,000 admissions annually. Babies in the NICU can be as born prematurely as young as 23 weeks old gestation and as tiny as one pound. Many new parents can’t hold their newborn; they may only be able to touch them inside the isolette. So much family emotion is present at the time these tiny babies come into the world. The parents want to be by the side of their newborn, yet have to take care of the responsibilities at home and work. The first senses that newborns have are touch and smell. While the parents cannot be by the baby’s side 24/7, we can help them provide a bit of themselves to the baby by creating small flannel hearts. The small flannel hearts are given to the parents. The parents can sleep with and live with the hearts for a short period of time infusing their scent. The parents will then take the hearts to the NICU to be placed in the isolette with their baby. Through the sense of smell, this will help to give the baby some security of their parent being nearby. Each baby receives 2 hearts so that while one is being laundered and ‘re-scented’, the other heart is in their isolette. Approximately 2,000 Lovey’s are needed each year. The Lovey directions and patterns can be found here: March of Dimes Lovey When your loveys are completed, contact Brenda Lambert at 745-434-3247 or at communityservice@indyasg.org to make arrangements for pickup. The Crawfordsville Neighborhood Group makes ‘Honor Flight’ bags for the veterans who make the day trip to Washington D.C. The flights travel from the Purdue University Airport twice a year. Each veteran receives a bag of goodies to make his or her trip a little more comfortable. There are flights leaving from other parts of the state. This may be a project you want to consider for your area. The pattern and instructions for the Honor Flight bag can be found here. For more information contact the Crawfordsville Neighborhood Group at Crawfordsville@indyasg.org. Do you have a project or pattern that your neighborhood group is doing and would like to add to our community service list? Contact Brenda Lambert at 765-434-3247 or communityservice@indyasg.org with information. Copyright ©2019. American Sewing Guild, Indianapolis Chapter. All rights reserved.